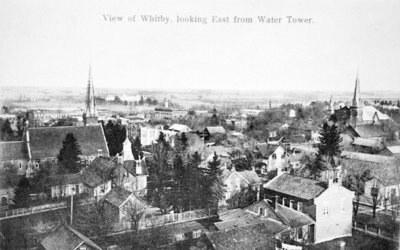 Black and white negative of a photograph of a postcard of an aerial view of Whitby taken from the water tower on Euclid Street. View looking south-east shows All Saints' Anglican Church (left) and the Methodist Tabernacle (right). Looking South-east from Euclid Street Water Tower, 1906, W.J.H. Richardson, Whitby Archives, 22-000-052.